Many people don't associate giving baskets with men when it comes to giving the perfect gift. That's one of the reasons why I love getting orders for a male basket. 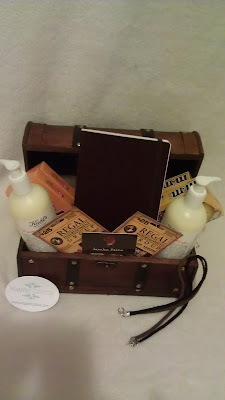 Gift baskets don't have to be all frilly with big bows and full of spa-like items. The gift basket for today's Men's Monday post was put together to celebrate the accomplishment of a former NBA player. Because he had everything, his sister wanted it filled with all of his favorite things (a gift card for his favorite smoothie place, his favorite lotion, a night to the movies and his favorite candy). I'm always trying to think of ways to think outside of the box and in ways that others may not. Since he started a non-profit organization for at-risk youth, here in Atlanta and lives in California, but always tries to make ways to remain active in the organization and the lives of the students. I suggested that I get a journal and have all of the current students write a note to congratulation him on his accomplishment and thank him for all that he's done for them through the center that they come to every day. I had even gotten some of the parents and past students to sign the journal as well. I shipped the gift basket to California in time for the celebration and it was a huge surprise to him and his family. The "gift basket" was even chosen because it looked like a little treasure chest so he could keep up with other treasures that mean something to him.